Let's paint a painting together. First you need an inspiring photo and as a beginner it should be one that is simplist. Some very wonderful photos are filled with layer upon layer of activity. This is the reference photo. This is my finished painting. For instance, this is one I did that took me a very long time to study and imagine how to create it's many layers in the composition and then a couple days of work to complete the painting. Look close at this reference photo and you will see there are yellow trees in the distance, small green foliage tress in front of them, a stream that winds back into the back ground with some rocks in the water, then there are trees that are in front of this that are tall and without foliage on one side and many big trees with foliage on the other side, falling leaves in the water and lots of blue ground cover with rocks covered in green moss. Yikes...lots of work. So, as you progress, tackling something like this painting is a challenge but very satisfying when finished. For today we will use a clouds reference photo. Most of my inspiration photos come from PMP website. A very cool place to spend some time looking for inspiration. Today's reference photo came from Unsplash, another free copyright free source of beautiful photos. So, now we have decided on a photo. Let's decide what paper to use. My favorite is Artagain by Strathmore. It is easy to work with and it takes several layers of pastels. Choose your color. I am using light orange as this the paper I have left. For this photo the color of the paper will not make a lot of difference in my opinion. Now your painting is ready to start. Some artists will plan ahead so far as to pick out all the colors they plan to use in their painting. I would rather let the process flow as I work so I begin with the obvious main color choices. As you use a color, set it aside separated from the other pastels so you will know what you have used. 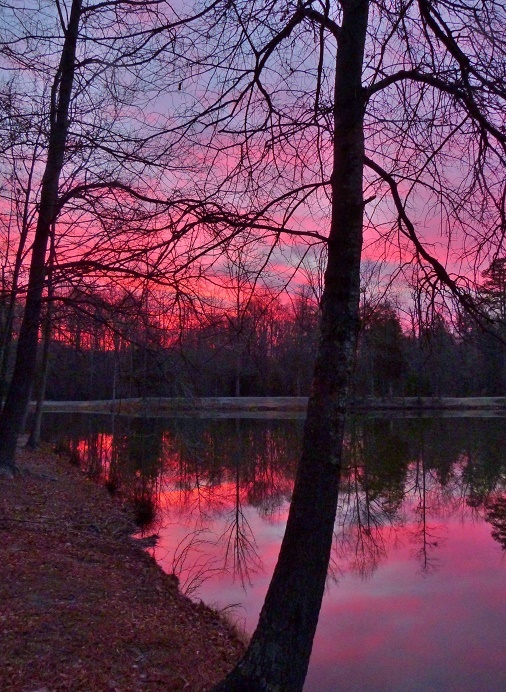 Often the same colors as you put in the sky and clouds will be reflected in water. It is good to use every color choice in more than one place to create a symmetry in the composition. There is no water in this photo reference to worry about but setting aside the pastels you use in your painting is a good practice is always helpful. To set up your picture you will need to tape an edge. This is painter's tape because it will pull off the paper easily when you are finished. Pastels smear very easily so making a border on your paper comes in handy for handling the finished painting. I have a template I made from some cardboard. It is the exact size of an opening for a mat used to frame a 8x10 picture. 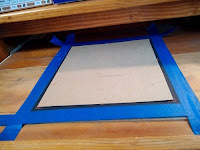 I tape the paper so the painting will be slightly larger than the 8x10 mat opening. This way I know my paining will easily fit the mat. center of the paper. In this photo the horizon line is unusual because this picture is all about the clouds. Use the bottom black area as your horizon. It will help to sketch in an outline you like for this area. Go ahead and use black for this picture as it will be black in the finished version. This image is the first layer of my painting. Looking at this you will probably be thinking, "What in the world is that supposed to be?" Bend each color separately and then add a couple more layers. Right now you can see the paper color and texture. The more layers you blend the more smooth and velvety your painting will become. Periodically lift the paper and tap the dust off. You can't tell by the image here but there is a layer of dark brown, with dark purple over it. Black is never really just black but is made up of several colors. There is a rule about skies and clouds. Each one is a little different. 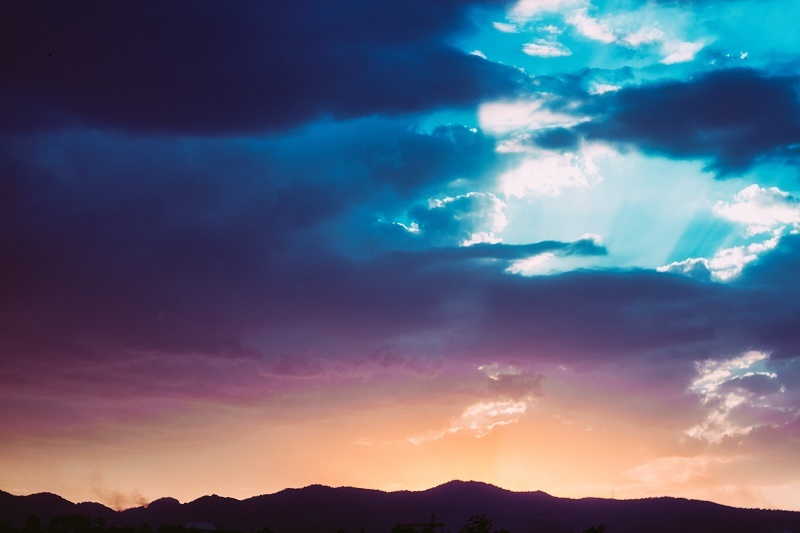 Clouds change according to the time of day, the weather, the season, and other factors. Clouds keep moving and ever changing. When doing the colors for sky and clouds you want to blend in circles. If you were doing water you would blend from side to side because that is how water flows. The main thing to remember is colors of the sky are darkest at the top and as they come closer to earth, the get lighter. To begin with your colors, start from the top and work down. Chalk dust will gather. Try to rub in as much as you can. You can tap off excess dust from time to time or blow it away. Blowing it up will get dust mixed in your lighter colors. As you blend you an use circular motions as this all clouds. Keep your fingers clean. I keep a wet rag and a dry rag handy. If you blend using a dirty finger you will get a dirty color. Now with each layer start blending each strip of color into the next very gently and slightly. Eventually you want the sky to look natural and a graduation of colors. In your final layers you will add the white of the clouds. Adding it in the beginning layers makes some color areas lighter. You will be laying down several layers building up your colors. Beginning layers are usually done with a light touch and toward the end you will use pressure to make your final detailed layers. If you don't get enough of the pastel worked into the paper, it will show through. It is a look but I like to get mine as smooth and velvety looking as possible. Blending mutes your colors so for the final detail layers very little or no blending is used, It depends on your painting. After layer three the texture of the paper will most likely be showing through your colors not sticking. At this point I use a fixative spray which sets the colors and does make them a little darker. It also builds more tooth in the paper to hold your last couple layers. As you work with your painting, let it speak to you. If your colors change, let it happen if it looks right to you or if it is pleasing to you. You are not taking a photo but creating an interpretation that is all your own and only you can create. You are the artist. Let your painting flow. In the final I used a small touch of black in the top blue to intensify the color. The bottom area has layers of dark brown, dark purple, random places of dark blue and black over top. Now is time for the final couple layers. You will define your clouds and highlight the light areas under them. The pink clouds are rather billowy so they need to be defined as clouds like the white ones. To make anything appear 3D you use a dark shade, a medium shade and a light color for the top, blending extremely softly just to smooth any hard edges. You can use pastel pencil or charcoal pencil along the top of the dark edges to make fine details or you can use the edge of your pastel stick. Here is how mine turned out. 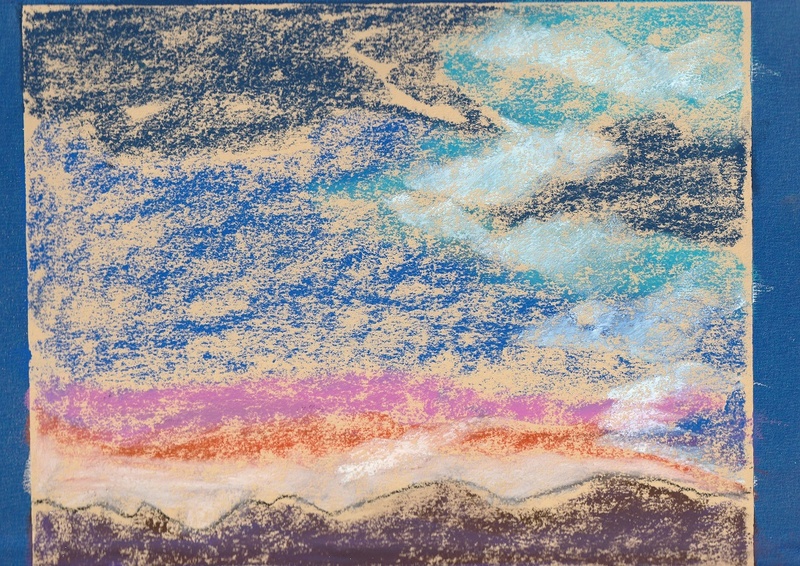 I used circular motions for the clouds and just did an upward swipe with the flat side of the pastel stick for the light rays. In person what appears to be white over the bottom dark area is actually a very light orange. It just never shows up on photos. Skies and clouds are fun. There is a freedom in the creating process because no clouds are the same and it is easy to let the painting tell you what it wants to be. For the final black on the bottom top edge of the dark area I used little squiggly strokes to create what might be trees or buildings in the far distance showing up against the clouds. So, there you have it. My final image is similar to the reference photo but it is my creation at the end of the day. I hope this helps your journey in pastel paintings. This is the photo that inspired me. I used it as a reference as well as an inspiration. I start by putting the photo on my monitor wallpaper so I can study all day. I think about the colors I will use, the layers I will build, where I will start and how I want the final version to look. This painting is my final version of this photo. Although I love the mountains and the effect of the mist mountains just did not work well in my version and all the mist became a small amount coming in from the side of the landscape. I wanted the pine tree to be more prominent so I made it larger and the birch trees in front became smaller. Often my paintings take on a life of their own and how I envision the painting and how it ends up in the final version usually is different. When the painting looks finished and everything seems to flow then I sign it and walk away. How do you know when a painting is finished? It feels finished! First I find a reference photo that inspires me. I find I must be "in the mood" to do a painting. 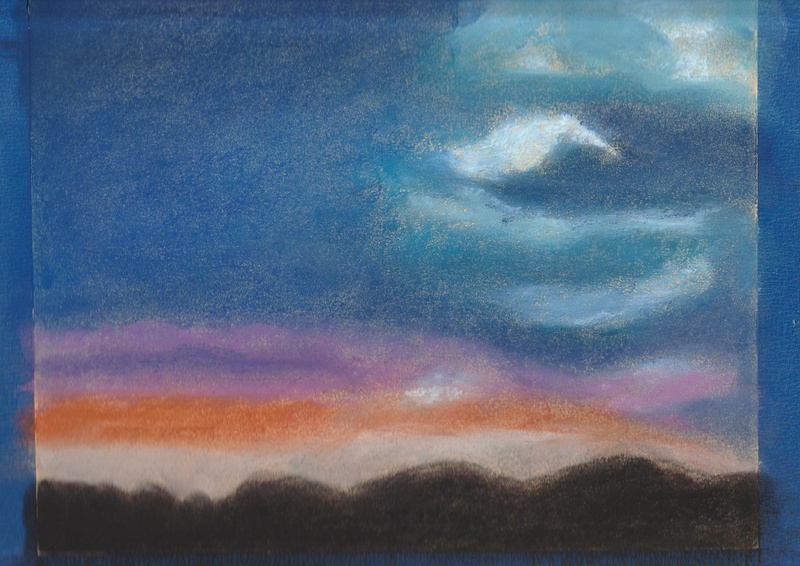 The more artwork you produce the more you want to use your pastels. 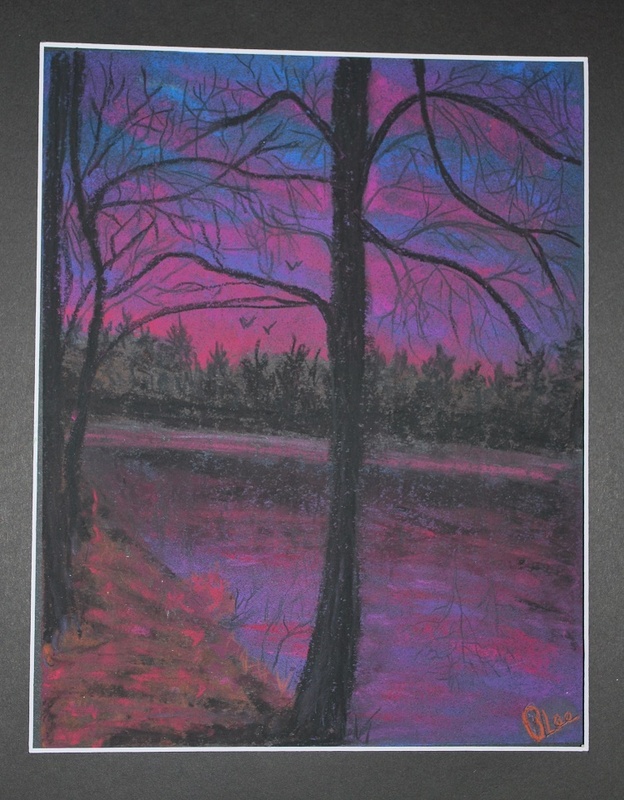 Painting with your pastels quickly becomes a passion. Every time I sit down and start a painting, after the first couple layers I always think, "I have no clue how to do this!" Then, I forget my insecurities and get into the artwork. It rather takes over and the pastels start to fly around the paper. I recently saw a quote that says, "When you think you don't know what you are doing is when a great painting happens." After the painting feels to me that it is done, I think, "Hmmm....not so sure I like this one." Once I have it tacked to my wall or take a photo of the piece, it is then possible to see it objectively. Then I think, "Hmmm, not bad!" Don't let yourself get discouraged. Not every piece will be a "keeper". After you have found the subject that inspires you and you have studied how you will approach the subject, it is time to sit down and begin. Now it is time to choose your paper. We have discussed different papers you might want to use. You need to decide the size you want for your painting and the main colors you will use to create the feeling you want. The example here was done on a medium blue paper. I used this because most of the colors are in the blue area. Sometimes artists will say it is best to use a contrasting color for your painting. Hmm...never really works for me so I use a color that will compliment my image and help produce the feeling I want. Most artists say you should use a gray paper if you are doing a winter scene. It does work. Remember paintings are all very personal to the artist and it will be your decision which paper to use for the effect you want. Reference photo from pmp-art.com Paint My Photo is an invaluable website where the photos uploaded as reference photos are taken by very talented photographers and are completely free of any copy-write claims. This makes using any of their photos as your reference material worry free should you want to sell you paintings. You can upload your painting of their photo to have it included in the website and also gives you an opportunity to thank the photographer for sharing their talent. They always have lovely, uplifting things to say about your art. That is very helpful, trust me! Other artists on the website will often find your painting and have nice things to say as well. Happy days! This is my final version of the reference photo. I chose black paper for this painting because it is all about creating a very early morning feeling when the sun has barely begun to rise. The image has a dark feeling so my painting needed to have that same dark feeling. Choosing the black paper was a good idea. It is done with Artagain paper. My favorite! The more paintings you do the better you get, the better you understand your medium and the more comfortable you become using your learned techniques and discovering new ones. I study my completed paintings to see what I did right and what I did wrong. Paintings usually look better from a distance and also look different in different lighting. Lighting in the room makes any painting done on black paper look different so this is something to keep in mind. Start your painting by lightly sketching areas that will define your image. For instance, when doing a landscape you always need to have a horizon line so this is a good place to start. Draw in your horizon line and work from there defining the general layout when doing landscapes. You can lay out your painting by freehand sketching lightly using subtle lines you can see but will not be hard to erase or work over. If you are doing something that requires a lot of detail you can trace the image on tracing paper and then use this to transfer details to your paper. Now you have guidelines. When working on your painting it is easy to get things too big or too small as you work. Having your guidelines will keep you on track. Different types of images require different techniques. I will be writing more articles to explain doing paintings of landscapes, animals, flowers, portraits, etc. This should NEVER be directly in the middle of the piece. It may come a little higher or a little lower than the middle of the paper. Horizon lines are usually pretty straight. If you study the horizon lines in both of my paintings here you will see I veered slightly away from a straight horizon line. It is a subtle thing but if you look closely, especially in the dark painting, the world seems a little tilted because my horizon line is not perfectly straight. So, I don't think it spoils either painting but "lesson learned". More to follow....I hope this helps. My next article will be about colors and values when it comes to blocking in your colors. 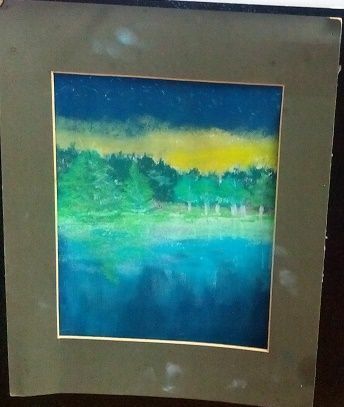 This is the first soft pastel painting I did where I learned the most important techniques. 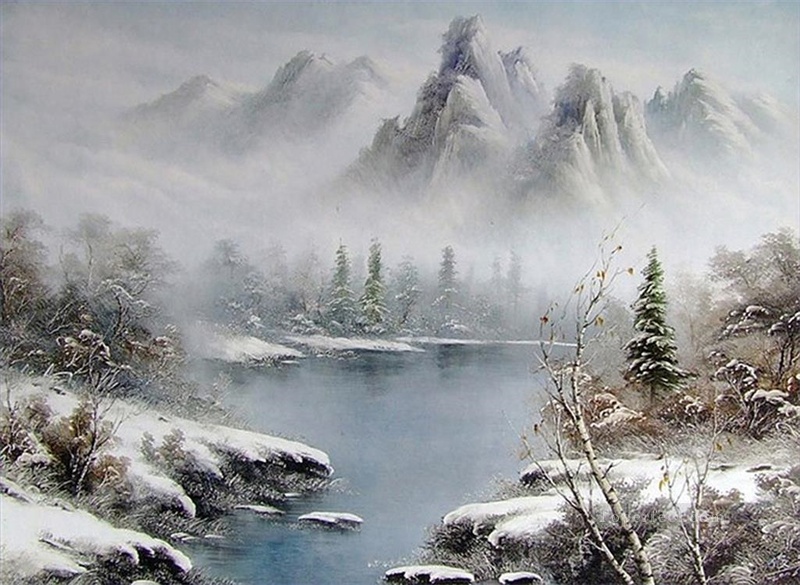 It is from this YouTube video that teaches how to create this painting. I would strongly suggest you check it out. Blend or not to blend...this is a big question. Many pastel artists will say, don't blend because it mutes the color. This is true. Blending does mute your colors and if you try blending the wrong colors together you may get mud. Think about how colors work together. For instance, if you lay down some blue and next to it some yellow, blending this together will give you green. There are times when your blended colors will create a new neat color or effect but to avoid getting mud, lay your colors down and blend each separately. As you work on your layers you can naturally blend colors together so it looks natural. Many artists will say only blend once in your painting. This is what they do because they use a painted first layer to set your colors. Then they just keep adding and blocking colors. It gives a Vincent van Gogh type of look and shows a lot of the underlying groves in the paper. I am not a fan of this look but they do sell many paintings. It is personal preference. I say, if you want a smooth appearing painting, an underlying base of blended pastels is necessary. Only the top couple layers are not blended unless there is a hard edge you want softened. Then the blending is just a matter of a light touch with your finger or blending tool to soften a hard edge. One of the main reasons I like paintings done with soft pastels is the velvety smooth finish. To achieve this look there are a few techniques you need to use. Pastel paper has what is called, tooth. These are small little groves in the paper which are there to hold the pastels you apply. Filling up the tooth takes using the right techniques. Paintings are done by applying several layers of pastel. The first layers are applied using light pressure of the pastels. Skies should be blended in circular motions. You can use different things for blending but I prefer my best tools, my fingers. In the video here you will see him begin by using the side of his hand to blend but I wouldn't do this unless my paper is very large. Keep a wet cloth handy and a dry one for whipping dirty fingers. Yes, you will get your fingers very dirty, but it does wash off. Always use clean fingers to blend. As you progress with the painting you will see the colors getting deeper with each layer. Then, use the same colors without blending and the effect will be brighter and more detailed. To get the finest details, you can use the edge of the harder pastels or pastel pencils. When doing water, blending the first couple layers is also important. This blending should be done in a back and forth way rather than in circles like in the sky. Water takes practice. It can have ripples, waves, reflections, foam, etc. 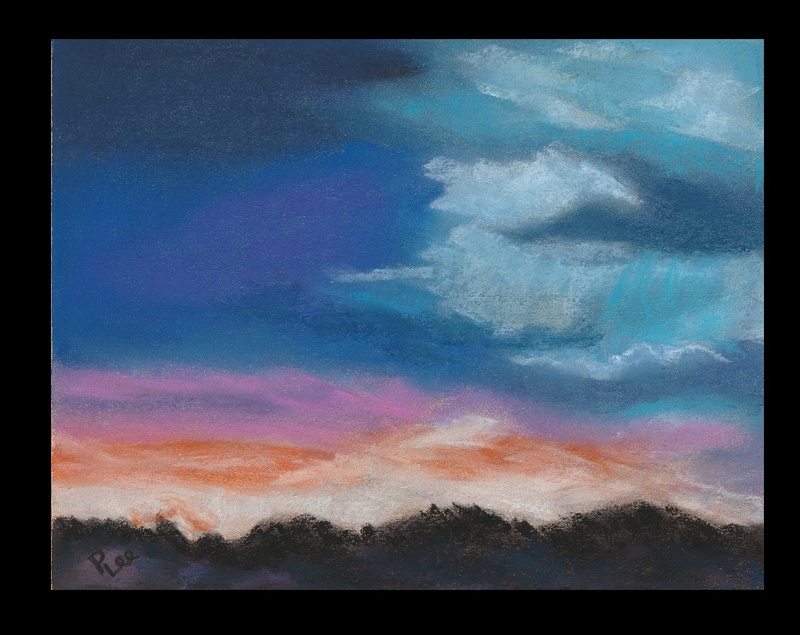 Keep experimenting by using your pastels in different ways. You can do your detail look by using short strokes, wiggles, blending and making the water smooth, using the edge of the pastel or lightly running the pastel over the water in horizontal strokes to simulate little ripples. Have fun and play with your pastels. Just remember to lay down layers using a soft touch and then pressing harder for the final couple layers to get brighter color and definition. This is a painting I did recently. I think it is a good example of how blending makes your painting flow. This is basically all water and sky. I wanted the sky to have movement and the water to have movement. To accomplish this feeling I used several blended layers. The layers were created using dark on the edges and then growing lighter towards the center. The sun hits the center of the water making it the lightest value. As I blended the colors I let the lighter values gently blend into the darker areas creating a flow. When you paint you will be creating a feeling in the painting much more than exact details. 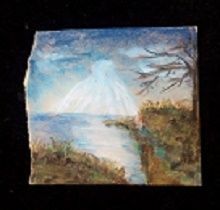 For instance, in this painting the sun is large but behind moving clouds. Even though you cannot see a full circle of the sun, your mind tells you it exists. Paintings should be an interpretation of a photo or plein air (painting outside) or even painting from a still life set up like a vase of fruit or flowers on a table. Drawing or sketching is all about each detail but painting is about creating the feeling or illusion of what you are representing. For instance, drawing a leaf you would draw all the details of the leaf and use a little shading to give it form. In painting you seldom do an actual single leaf but rather use different strokes and different colors blended together to give the illusion of a leaf. To get a 3D effect in anything you paint use 3 lightly blended colors together to give it form. A petal of a flower has a natural round look when 3 shades of the petal are used together and lightly blended to remove any hard edges. A pink flower will have the pink for the overall flower, a very light, almost white pink for the edge where light hits the petal and a dark pink or even a purplish pink to create the dark areas of the petal where the light is obscured. Painting is about creating something that your mind's eye will fill in as real. Blending is about creating a smooth appearance and an illusion. Next we will talk about blocking in colors. Where to Start as a Pastel Artist - What paper to use? This is my favorite paper. I will explain why. The first paintings I did were done on white (a big no-no) cheap paper. Choosing good paper without spending a ton of money is difficult. The following three paintings were done back in June 2017 which were my very first efforts. The last one here was my favorite in the beginning and I hung it behind an old mat on the fridge for months. Six months later I threw it away because the majority of the pastel dust had fallen away. Lesson learned. No more cheap white paper. In all fairness, loosing the pastel from the paper has a lot to do technique. I will explain this in another article. pad of paper. drawing. pad of white paper. 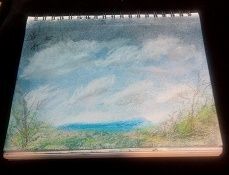 Now I use Strathmore Series 400 paper for doing pastels. 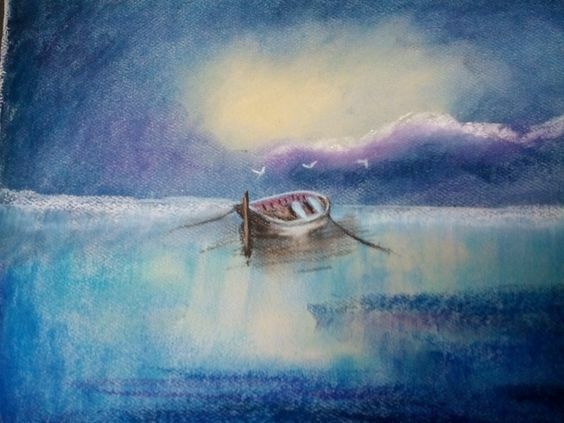 You can use your soft pastels on paper that is not designed for pastels but the problem is: There is no tooth in the paper so there is nothing to hold the pastel. Over time the majority of the pigment will fall off the painting. So, spending a little more money on your paper will make a huge difference. The best papers are very expensive. Until you are at the point of doing commissioned work or charging hundreds of dollars for your paintings, I really think Strathmore Series 400 is a good choice. These paintings I did in November 2017 have dropped no dust to date and the surface will hold several layers of pastel. A paper that is made for acrylics just will not work for pastels. Drawing paper has no grit to it or tooth as it is known to hold the chalk over time. When you create a pastel painting you will need to do several layers of the soft pastels to get your desired effect and yet a last layer for putting in your fine detail work. You must use a good paper. I have searched the Internet many times looking for the best options for paper. As usual, I found that Amazon has the best deals. 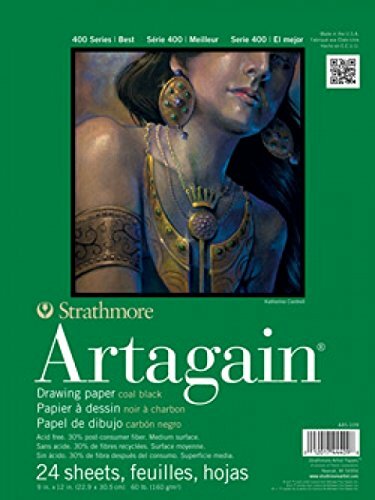 My favorite paper is by Strathmore and is called Artagain. This is made from a recycled paper and the tooth is there but not so harsh as some of the others. I prefer my paintings to be soft in appearance. Many pastel artists like the blotchy, grainy look. I am not a fan but they do have very successful businesses selling these paintings and even running teaching classes. Art is a very personal thing. Everyone looks at a painting as see something a little different. What is beautiful to you may not be to someone else. AS an artist your work does become very personal in that you put a little bit of your heart and soul into each creation. Being a successful artist is about your passion, your experience and of course getting your work in front of potential buyers. The latter is not something I had considered when I began painting with pastels. However, it has become a passion and almost every day I create a new painting. Carson paper for soft pastels is something I have used. I did this paining using this paper. It is a good paper and comes in a choice of colors which is good. The problem I have with this paper is the tooth is really difficult to cover up so if you look closely you will see the texture. Again, not a fan of this look. I worked and worked on this painting trying to fill all the tooth. Unfortunately, there is a point where the tooth gets filled or crushed and it is not possible to lay more pastel down. 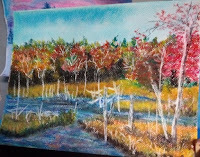 If you look at an enlarged version of this painting you will see the grainy look. Overview, you must choose a paper that is intended for using soft pastels. It is a form of paint as it is compressed, dry pigment, however, it will only stick over time to the better papers designed for their use. I have heard of pastel artists who use other grounds than paper like canvas. 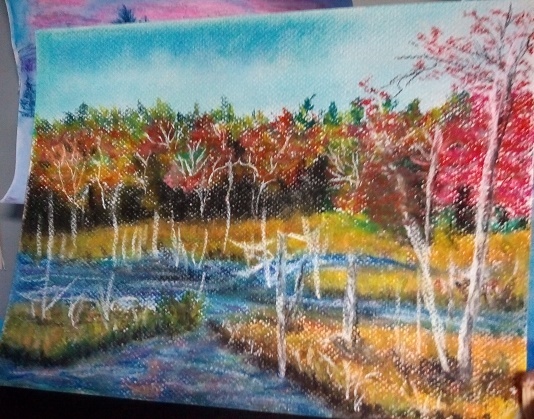 It is not something I have tried but it seems to me canvas would produce a very grainy look and other grounds would not hold the pastel pigment over time. 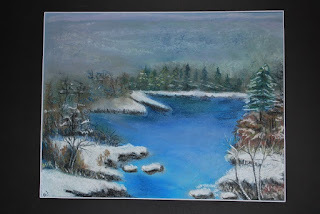 When you create a pastel painting it should last for years to come if you have used good ground and used proper techniques. I hope this information helps. Number one concern for a new artist is what kind of pastel chalk do I buy? This can be very confusing as there are so many types available. 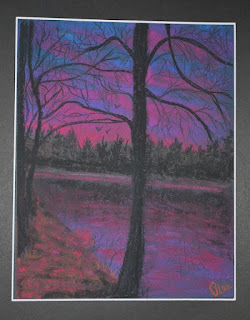 Personally, I think it is best to start what a good soft pastel but not the most expensive. You must have something to "get your feet wet" so going inexpensive is a good start. 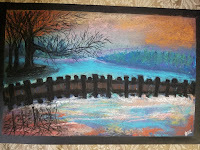 If you decide it is not for you the money you spent is not great and you can always pass the soft pastels on to someone you know who would like to try this medium. I started with soft pastels made in China. The brand name is Mungyo and Amazon usually has the best pricing. 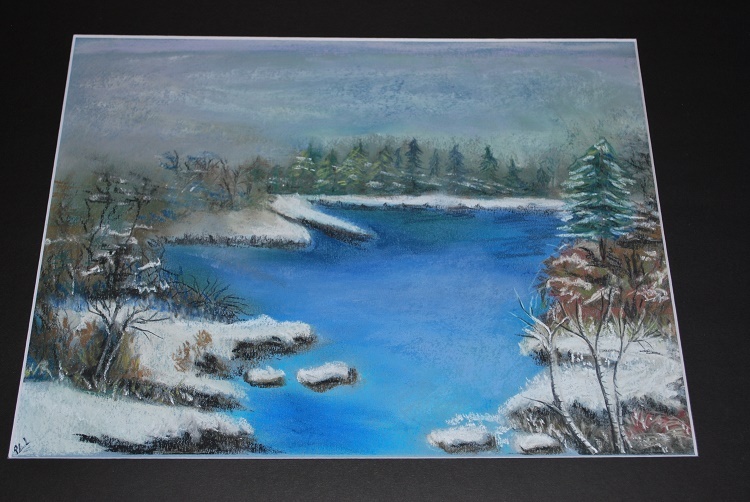 Here is a link to their soft pastel page. I now have used brands that are a lot more expensive but still also use these pastels. In fact, I am on my second box and have given them to my grandchildren as gifts. These are certainly not the best you can buy but they work well, especially for the beginner. A little something about soft pastels. There are soft pastels and there are oil pastels. Oil pastels are not a common choice for pastel artists. They are more like fancy crayons as they require a special technique for using them. Soft pastels will make a mess of your hands but it washes off easily. They create a lot of pastel dust. To get rid of extra pastel dust you can tape it off or blow it off. Most artists use a tray to catch the excess dust or tap it off the painting onto a catching tray. I find that a little too fiddly so I just blow it away and then when finished give it a final tap on the back to rid it of any loose dust particles. AS as caution, blowing dust over the painting might cause some unwanted particles to stick where they are not wanted. Just saying. Soft pastels come in half-sticks like the Mungyo or long sticks. They can be square sided or round. 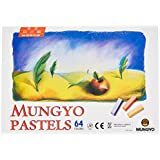 If you follow this link to Amazon Mungyo pastels and look at the Q&A section you will see a lot of common questions asked and answered about these soft pastels. This is directly from the page as the answer posted here is really excellent. Hi! could somebody enlighten me a bit about the difference between Soft Pastels, compressed pastels and soft pastel chalk? Thank you!! Hi! 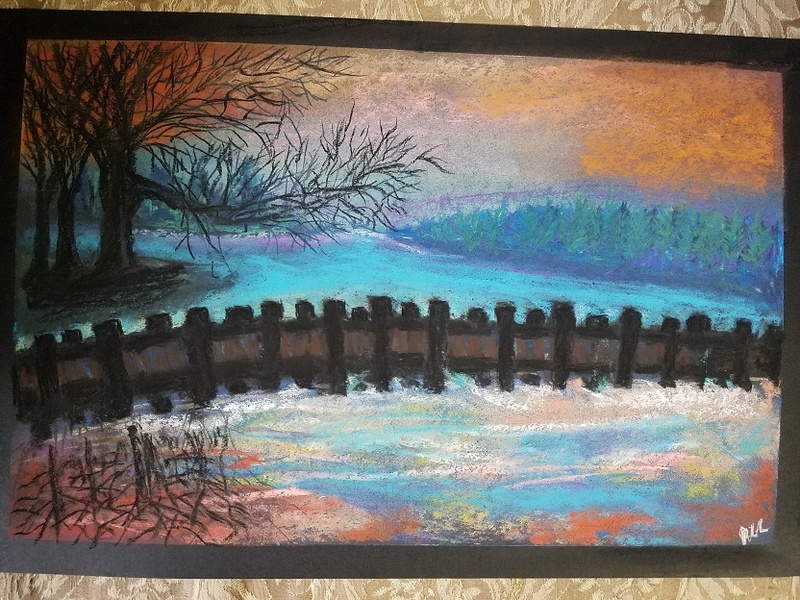 Soft pastels are quite different from pastel chalk. Chalk has only a fraction of the pigment of soft pastels and is comprised of a lot of binder, only a small amount of pigment. I'm guessing by "compressed" you mean hard pastels, which are much harder to break and require more pressure to leave a mark on the surface. 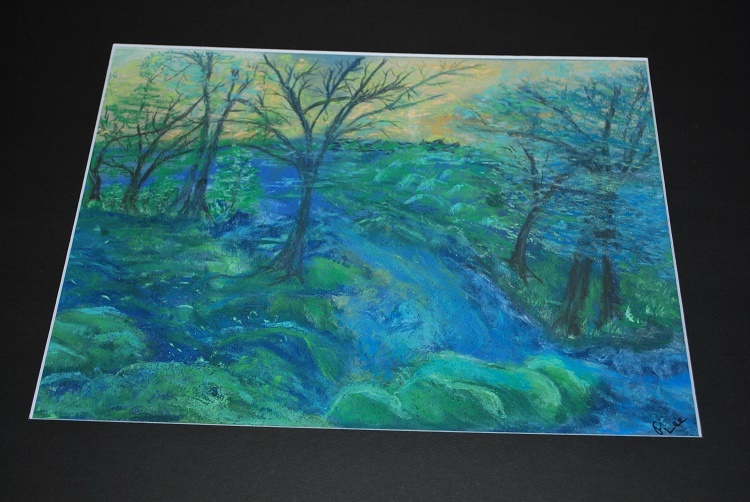 Typically, one would sketch their painting with a hard pastel, or use it for finer details. Half-soft pastel brands are used for blocking in color after you have completed the drawing. 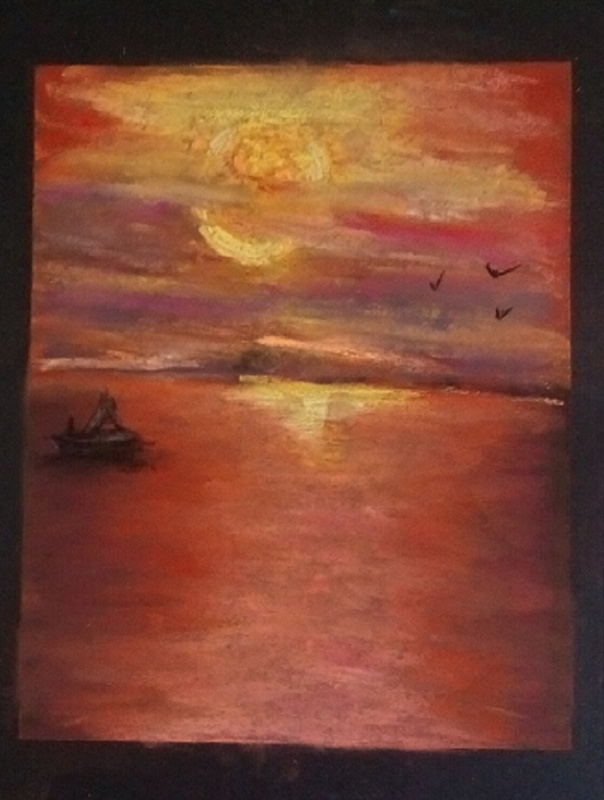 Finally, after applying several thin layers of the half-soft pastels, you would use the soft pastels to finish the painting. The hard pastels are used for drawing, the half-soft are used to build up layers of colors, the soft pastels are used for the final layer of color. A good hard pastel is Conte, a good half-soft brand is Rembrandt or Unison and a good soft pastel is Sennelier, Ferrario, or Holbein. Mungyo brand for artists is a good half-soft brand. Please visit my new online shop to see my pastel paintings. Thank you for reading my post.